These are Antarctica's two most photographed waterways. Because they lie conveniently near each other, they often become part of the same cruise itinerary down the west coast of the Antarctica Peninsula. Glaciers, sheer cliffs and snow-crowned mountain peaks dramatically line the narrow Lemaire Channel and Neumayer Channel. Glacial calving is a common occurrence along the banks of these channels. 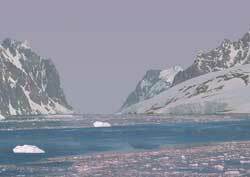 Careful navigation is essential because the channels are interspersed with icebergs and ice floes. Occasionally cruise boats cannot pass completely through the two channels because of temporary ice blockage. Penguin colonies and basking seals dozing on rocks add to the tourist's viewing experience, as do the playful whales that sometimes accompany the cruise boats. Tours include Zodiac (small inflatable boat) trips for up close views and shore landings.